Canvas Seat and backrest. Height adjustable handles with ergonomic grips. Dual action brakes for both slowing down and locking on. Useful shopping bag and Cane holder. Stepper tube to help get up curbs or small steps. Puncture-proof solid tyres. Height adjustable handles: 80cm/31.5″ – 92cm/36½”. Includes looped straps to keep the rollator closed. 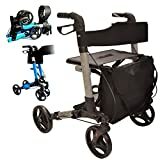 Folds up very compact for storage and travel compared to standard rollators. Available in silver or blue. MAGNETIC BRACELET LADIES WITH CLASP CLOSURE. Alloy Magnetic Bangle with Silver Plating. Choose from Various Designs and Colours Above. Approximate Sizes. Length: 200mm. Link Length for Adjustment: 9mm. Width: 9mm. About Magnetic Therapy. Magnetic Therapy is a NATURAL, SAFE, DRUG FREE therapy which is believed to provide the following benefits and many more:- Relief from the effects of osteoarthritis and rheumatoid arthritis. Promote restful sleep to aid with insomnia. Stimulation of blood circulation. Relief for aching joints and muscles. Helps to feel less tired and fatigued. Relief for headaches. Raising oxygen levels. Relief for period pains and stress. Magnetic therapy has no known side effects, you can wear magnetic jewellery for an indefinite length of time regardless of magnet strength and they are safe to wear around computers and laptops. Magnetic products must not be used during pregnancy, if you have any electrical implants or pacemakers, on open wounds, if you are using insulin pumps, or for young children. Magnets have been used as therapy for thousands of years, dating all the way back to the ancient Egyptians and Greeks. Our Magnets. 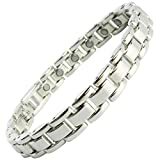 The magnets in our Magnetic bracelets are 3000 Gauss strength. Please note that all copper bangles and bracelets can sometimes leave a slight green residue on your skin, this is a natural effect of copper and is easily washed off. Disclaimer: Our magnetic therapy items are not sold as medical devices and as such we make no medical claims. Magnetic therapy will not provide a cure and we cannot guarantee that you will experience any of the benefits outlined above, with that said many people claim to find relief from many ailments as a result of magnetic therapy. 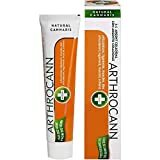 Gel with Cannabis Sativa Hemp, Colloidal Silver and Omega 3 & 6 unsaturated fatty acids, designed for massage of the skin in the areas of joints, muscles, tendons and back. This product is particularly suitable for local use at the location of acute or chronic problems of the musculoskeletal system. The gel is indicated for topical application in the area of the joints, muscles, tendons and back. Supports regeneration, relieves muscle fatigue after sports and physical exertion. It is a good complement to rehabilitation after operations, fractures and sprains. A light massage of the affected site enhances the effect of the preparation. Thanks to its consistency, the gel is easy to spread, non- greasy and easily absorbable. Recommended Use: The recommended application is three or four times a day with at least 3 hours between the individual applications.